District Attorney George Gascón will make a decision in six to eight weeks on whether to charge the officers who fatally shot a homeless man in the Mission in April 2016, said Adriana Camarena, an advocate for the man’s family who met with Gascón on Wednesday. Camarena talked to reporters on the Hall of Justice steps following the meeting. It was the first time Gascón had met with the family since the incident. The District Attorney’s office has filed no charges in any of the five police shootings in the Mission District since 2011. Police shooting cases are notoriously difficult to prosecute because an officer’s state of mind – whether they perceived a threat –plays a major role in determining whether the officer acted reasonably and within the law. But Camarena argued that Gascón should be using his new $1.5 million unit dedicated to investigating police shootings and in-custody deaths to overcome those hurdles. She further asserted that Gascón is prioritizing new cases over old ones, such as Gongora Pat’s. She said an investigator named Andrew Law has been assigned to the case, and she has given him the names of eight eyewitnesses who contradict the officers’ accounts. Law is following up with the witnesses, she said. “They say they have been looking at all the evidence,” Camarena said. On April 7, 2016, Sergeant Nate Steger and Officer Michael Mellone fatally shot Gongora Pat, a resident of a tent encampment on Shotwell Street, who police say charged at officers with a large knife. However, eight eyewitnesses told reporters in the days after the shooting that Gongora Pat never threatened the officers. They shot him within 30 seconds of exiting their patrol car, according to the record. Steger and Mallone are both on active duty, said SFPD spokesperson Officer Giselle Linnane. She said Steger is now assigned to the Special Operations Bureau while Mellone is assigned to the Administrative Bureau. Gascón has declined to file charges in any of the cases in which police have killed civilians. His office has completed 11 of the 20 investigations underlying his decisions on whether to file charges in such cases. The other nine cases, including Gongora Pat’s, remain open. Camarena was not confident Gascón would file charges, but made it clear she and others would continue to press for justice. Camarena was joined by Gongora Pat’s cousin, Luis Poot Pat, as well as his brother, Jose Gongora Pat. Camarena said a “low-profile observer” from the Mexican consulate was present at the meeting, as Gongora Pat was an immigrant from Yucatan. She said the consulate lodged a “formal protest” with the United States government following the incident. “Depending on what the DA does or doesn’t do, we (activists and the consulate) do have the ability to request the case be reviewed by the Department of Justice,” she said. 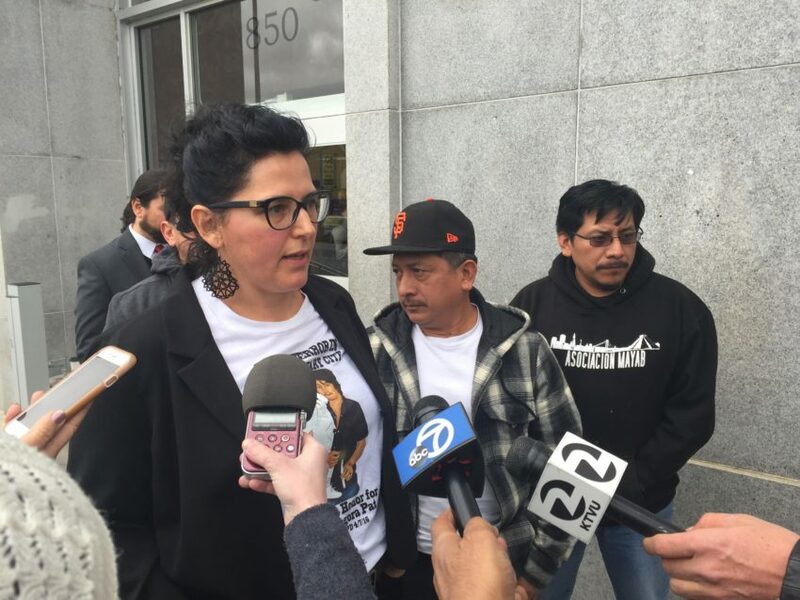 The Gongora Pat’s family has sued the officers and the City of San Francisco for what they believe to be a wrongful death. The trial is set to begin in October. Its a shame — if officers had been allowed to use tasers Gongora would be alive today. They used non-lethal rounds first but it still escalated. Yes – but no taser, which is more effective. It’s unfortunate the officers killed a person who threatened homeless outreach workers with a 13in knife while high on methamphetamine and living illegally in a tent in front of the neighborhood playground. His family is suing the City? It should be the other way around. The police are meant to protect the citizens, and they did. Their job would be easier if the city didn’t use the soma and mission as the dumping ground for the city’s unhoused. Have a tiny crack in the sidewalk In front of your apartment in the mission? This month you get a four-figure bill to fix it or have a lien put on your house, while the city allows people to sleep on the sidewalk in front of Caesar Chavez school and Jose Coronado playground so every kid in our neighborhood can worry about our their future.